On the roof of the world lies an ancient kingdom was known as Guge. The Guge kingdom reveals its mystical stories of the legendary palaces and its ancient cultures that fascinates the trekkers. The main highlight of Lhasa Kailash Guge Kingdom tour is the hundred years old monasteries that reflect the Buddhist religion and also the renowned fortress of Gyantse and Shigatse. It has attracted thousands of visitors over the years. Tourists embark upon the incredible view of the beautiful snowy mountains, astounding landscapes and thrill-full trekking around Mt. Kailash. The upland drive back to Kathmandu via Friendship highway offers majestic views of the Himalayas from both, Nepal and Tibet. Any trekker with moderate physical fitness can join the 3 days trek around Mt. Kailash and enjoy the life journey. The journey to the Lhasa Kailash Guge Kingdom begins with a thrilling flight from Kathmandu to Lhasa above the clouds, amidst the mesmerizing view of the lush green forests below them, surrounded by the peak of the massive Himalayas from all sides. Lhasa is a town worth exploring as it consists of a variety of Buddhist tradition, ancient palaces, serene monasteries reflecting the culture and lifestyle of the locals and finally the famous fortress, Gyantse, and Shigatse. At the heart of the region lies the main highlight of the journey, the holy site, Mt. Kailash. After discovering every trails and attraction of Lhasa, we make our way up towards the Guge Kingdom, driving through Zanda and Tsaparang. 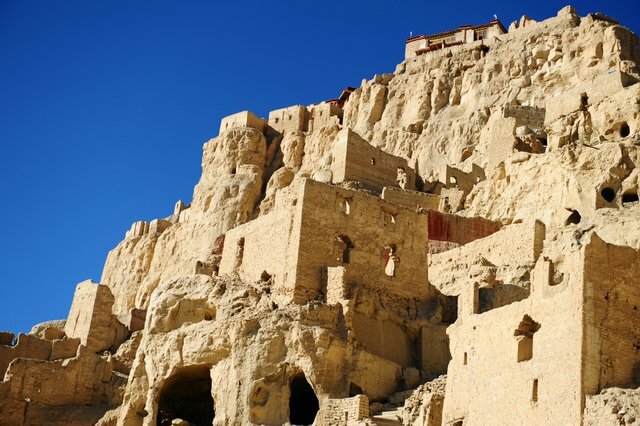 The two main attractions and a must visit place here is the Tsaparang castle and the Tholing Monastery as it contains murals and motifs that existed from a thousand years ago, still safe and sound. The route further takes us up to Saga which is the final destination of the trek before we descend down to Kathmandu. 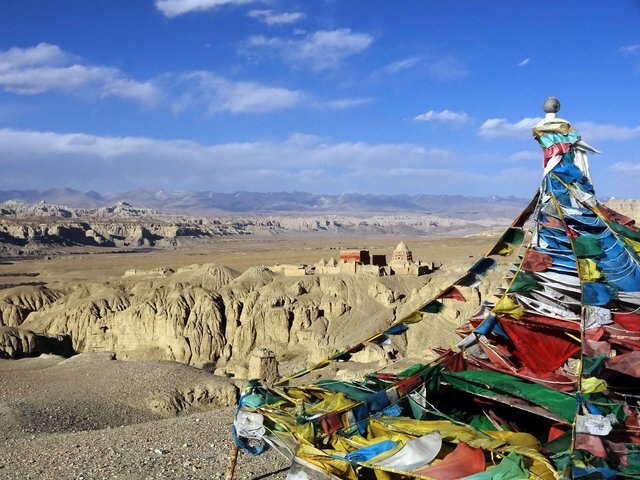 All in all, Lhasa Kailash Guge Kingdom tour is a journey that takes you to the roof of the world, giving you an opportunity to witness the scenic beauty of the Himalayas with the perfect blend of culture and ancient history. Alpine Eco Trek highly suggests you to apply for Medical Insurance, covering emergency evacuation and all medical expenses are must for Lhasa Kailash Guge Kingdom tour. So, please be insured prior to the holy journey to the Heavenly Abode of Lord Shiva. Meals during your stay in Kathmandu are provided in package at the same hotel where you stay. Meals during the journey will be all vegetarian. Alpine Eco Trek's staff will serve you hot and delicious meal at every day breakfast, lunch and dinner on the way in Lhasa Kailash Guge Kingdom tour. 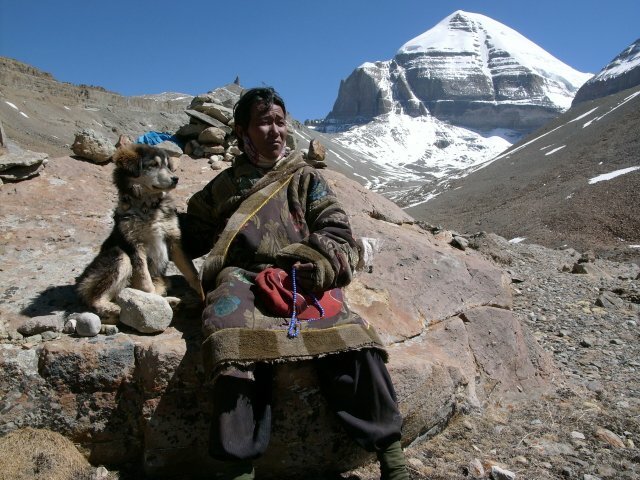 We will provide you packed lunch while doing Kora around Mount Kailash. And, we also suggest you to bring some of your favorite dry foods, sweets and ginger and garlic Candies along the tour. We will provide transportation for Lhasa Kailash Guge Kingdom tour depending on group size like if there are below 5 we provide a Jeep, if 5 to 08 we provide a Van, if 08 to 16 we provide two vans, if above 16 up to 25 people we prove a deluxe bus. Upon your arrival in Kathmandu International airport, our airport representative will be receiving you and the representative will be displaying Alpine Eco Trek's signboard outside the airport terminal. You will be then transferred to your respective hotel in our private tourist vehicle. We will provide you with detail briefing about the trip and necessary things that you will need during journey. Overnight at Hotel. Our day begins with the sightseeing of the city. First, the breakfast will be provided in the hotel and then continue for the sightseeing tour in Kathmandu. You will visit some famous temples as Pashupatinath Temple and Budhanilkanth Temple. These both temples are most significant holy temples of Nepal in regards to Lord Shiva & Vishnu respectively. We will also visit some UNESCO World Heritage sites and Kathmandu Durbar Squares. Then you return to your hotel and free time can be used for personal activities and other pre tour preparation. Regarding obtaining visa, our office crew will do all the formalities for visa and take care of all your necessary travel documents. Overnight at hotel. After breakfast at hotel, around 8:00 A. M. we will be transferred to Kathmandu airport for a scenic an hour flight to Lhasa. The flight takes us right across the main Himalayan range and provides us with magnificent mountain views. This is one of the most beautiful air routes in the world terminating in a dramatic landing on a hillside surrounded by high mountains peaks. After landing at Gongar Airport, our Tibetan guide will take us to Lhasa which is further 2 hours' drive. It is highly advisable to acclimatize for rest of the day due to Lhasa's altitude. Overnight at hotel. Today, we will start our day with the visit of Potala Palace which dictates the city of Lhasa. It's a remarkable building that contains private quarters of the Dalai Lama as well as numerous grand state rooms and many important chapels. The Palace existed here since the 5th or 6th century, but the present Palace was constructed in the 17th century in replacement of the old one. After visit the Potala Palace we will visit Jokhang Temple as well as Barkhor market. Overnight at hotel. The entire day today, we spend in visiting historic monasteries in Lhasa. Among one of them is Sera Monastery which is the best-preserved monasteries in Tibet. Within its whitewashed walls and golden roofs, several hundred monks live and study here. After visiting Sera and Drepung, if time available we will visit the Norbulingka, the summer palace of the Dalai Lama. Overnight at hotel. Beginning our adventure in the Himalayas, today we drive to Gyantse via Yamdrok lake where we will get an opportunity to visit the famous Gyantse Kumbum as well. Along the way we cross over the Kamba la and the Karo la passes with spectacular views. Then we drive to Gyantse, where we will visit the Pelkor Chode monastery and Kumbum Stupa followed by two hour drive to Shigatse. Overnight at hotel. Today, there will be an arrangement for us to visit Tashilumpo Monastery and the spectacular tombs of Panchen Lamas. We can also see the monks of this monastery nice looking with their home-made traditional shoes. After spending few times here, we then drive to Saga passing several high plateau lakes, towns, herder's tents. Along the route with plateau mountain ranges we can see diverse forms of mountains overlooking through the valley. Towards the south, we can see sandbanks, Rocky Mountains, and snow-capped peaks. Overnight at guest house. Our day begins with drive through a wide valley along a scenic river where can watch the grazing land of yaks and sheep. Depending on the season, travelers and other mobile shopkeepers will be attired in traditional costume. We can join them for a cup of hot tea in their home. Then we continue our drive to west. In the late afternoon we will catch the first sight of Holy Mt. Kailash and Lake Manasarovar. Then arrive in Manasarovar and spend the night in the guest house near the Lake. After completing an exploration of holy lake, you can dip into the lake, Homa/Puja for Hindu pilgrims, we will drive towards Dachen which is considered as a base camp for Holy Kailash Parikrama. The rest of the time will be spent prepareing for the circumambulation around Mt. Kailash. Overnight at guest house. Today is the first of our holy Kora around Mount Kailash, the day starts with trekking from the Sershong and a steady walk with many other local pilgrims chanting and praying. We can see the Choku Monastery up on the hillside from the valley. Then the trail leads to few ups and downs till we reach our camp at Derapuk where we will see many more Bon pilgrims circumambulating in the opposite direction (Anti clock-wise). Overnight at a mud house. 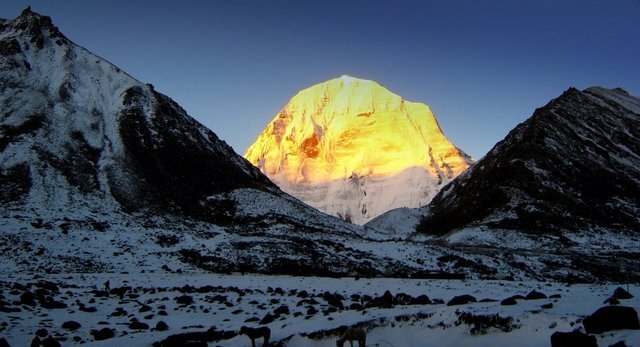 The second day of Kora leads to much higher altitude of the holy path just beneath the Mount Kailash. The hiking will bring us to one of the highest point at Drolma La Pass (5636m), and the pass is quickly descends to the gradual field towards Zuthulpuk monastery. In Tibetan it means magical cave. This small monastery is connected to an interesting story of talent competition between Great Yogi Milarepa(Buddhist) and Naropa(Bon). We will spent night at a mud house. After breakfast, we have given some free time to explore the caves, temples and shrine around Milarepa cave and then start walking 3 hours at flat land near by Darchen and drive with tour regular transportation to Manasarovar via Darchen. Overnight at Guest House banks of the Manasarovar Lake. After breakfast, we drive from Manasarovar to banks of the Sutlej River. It is 4 hours driving to reach Tirthapuri which is a holy place of Bhasmasur in Hindu and closed associate with Padmasambhava (Guru Rinpoche) in Buddhism. Hike-up to visit monasteries containing footprints of Guru Rinpoche. At the end of day, reach at Thada (Zanda) town and overnight at guest house. Today, we explore Tholing and 20 kilometer east Tsaparang valley today. Visit Ruins and significantly important monasteries. Both valleys have significant role of Buddhism containing most important monasteries and other holiest sides. Overnight at guest house. After breakfast at lost kingdom we retrace our journey back to Lake Manasarovar. We stay at guest house near the bank of Lake. Explore evening view of Lake and Mount Kailash. Overnight at guest house. We will start heading back to Saga and today is the last time that we can see the view of Mount Kailash. Overnight at guest house. After an early breakfast at Saga, we start our amazing day with a scenic drive over the vast Tibetan Plateau crossing the several high passes to Nyalam. We have lunch break at Nyalam, after lunch we drive down to Zhangmu, farewell the Tibetan guide and driver and cross the Friendship Bridge and start another 5 hours scenic drive along the Arniko highway to Kathmandu. Overnight at hotel in Kathmandu. Enjoy hot shower, good meal and cozy room. After breakfast, the tour leader from Alpine Eco Trek will farewell and transfer to Kathmandu International Airport to board your flight back to home. This is an amazing way to end a life-changing journey. Come join us for this memorable trip. All necessary airport arrival and departure, drop, pick up to/from Kodari transfers by a private coach. Three night's accommodation in Kathmandu in 3/4 star standard hotel twin sharing room with fullboard meals. 14 night's accommodations in Tibet on private room sharing basis using guesthouse and hotels. Permits for Manasarovar Prikarma and Kailash Kora (round). Private transportation in an eight seated deluxe van for clients and small truck for staff and food during the trip. Yaks and Yak-men to carry baggage, food, fuel etc while making round of Mt. Kailash. Services other than specified. Extra days stay at Kathmandu than 3 nights/ any other place. Our webiste contains as much information as possible about Mount Kailash & Tibet Tours and Treks. However, if you have any questions regarding trip, please feel free to contact us. We answer all enquiries within 24 hours. If you want to book a trip, you can send us an email or contact us directly by phone: 0977 98510 36844 (Ram Kumar Adhikari).